After months of anticipation, trees and plants are being installed in the median strips at the north entrance to Larchmont Boulevard. The project was awarded grant funds as a part of the 2009 Metro Call for Projects. Community groups also contributed funding, including the Windsor Square-Hancock Park Historical Society, the Windsor Square Association and the Hancock Park Garden Club. BUSINESS OWNERS, neighbors and city officials gathered at the groundbreaking for new medians on Aug. 12. Following the Aug. 12 groundbreaking, Bureau of Street Services crews dug the trench for the first of three medians, officially titled Larchmont Boulevard Medians Phase II. 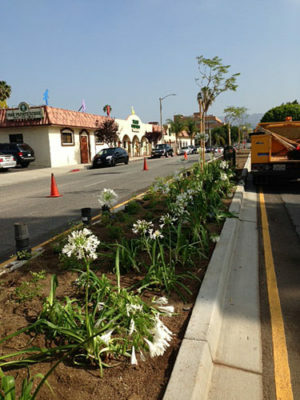 The eight-feet-wide medians were installed between Melrose Ave. and Rosewood Ave. The first contains a gateway monument similar to the one installed at south Larchmont Blvd. and Third St.
That median project was funded, designed and constructed a decade ago from First to Third St. and was spearheaded by LaBonge’s current chief of staff Carolyn Ramsay. THE MEDIANS create a greener, cooler environment to the street. Larchmont Village Neighborhood Association has agreed to maintain the new medians.